Widow Shirley Partridge (Shirley Jones) is coerced by her musican children to join them in recording a pop song in their garage. The kids are hearthrob Danny (David Cassidy, Jones’ real-life step-son), intelligent Laurie (Susan Dey), conniving Danny (Danny Bonaduce), precocious Chris (Jeremy Gelbwaks, later Brian Forster), and cute Tracy (Suzanne Crough). Danny enlists the help of manager Reuben Kincaid (Dave Madden) who helps to make their song a Top 40 hit. The kids later convince Shirley to let the family go on tour. They purchase an old school bus, paint it, and hit the road for Las Vegas and other performance gigs. Episodes often feature musical performances by the group and, later in the series, precocious neighbor kid Ricky (Ricky Segall) joins the group. 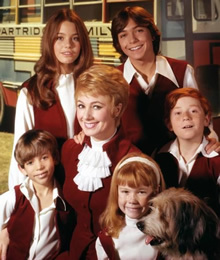 The series inspired an animated spin-off entitled Partridge Family 2200 A.D. but few of the original series castmembers had any involvement. The Partridge Family: New Series in the Works — Will This One Succeed?